Figure 1: BioSHADE installed on a C-OPS surface reference with BioGPSBioSHADE is a shadowband attachment for the C-OPS Surface Reference instrument. The instrument uses a shading band that covers 180° of rotation enabling it to be used on boats or ships where the heading is not constant. When on a ship, the band's motion is a smooth sweep from 0° to 180°. When operating on land, the system can be programmed to move the band in front of the Sun's direct beam to perform measurements of diffuse irradiance. The software running C-OPS ("µProfile") contains controls for the BioSHADE, allowing the user to enable or disable shadowbanding, and to set the rate of movement. 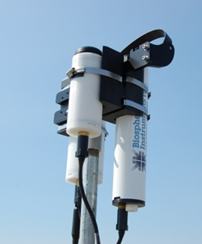 BioSHADE integrates into the C-OPS network with the BioGPS and one or more surface reference instruments. This assembly of BioSHADE, BioGPS, and Radiometer is supported by a single cable and can be located as far as 150 m away from the system control unit ("deckbox") and power supply. The deckbox automatically compensates for cable length to provide optical power to the system. 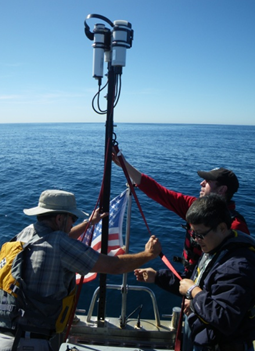 Figure 2: BioSHADE deployed on a small boatFigure 2 shows BioSHADE installed on a small boat. In this application, the built in angle (pitch and roll) sensors and high radiometer sample rates can be helpful in filtering data to eliminate episodes of excessive ship motion. For the complete description of BioSHADE, click here for the chapter dealing with this from the NASA Technical Memorandum "Advances in Measuring the Apparent Optical Properties (AOPs) of Optically Complex Waters," NASA Tech. Memo. 2010–215856.